The transmitter located in the plane has a simple wire antenna attached. This is small, easy to install in most models and transmits reasonably well in all directions. The receiver is where you have a lot of choice of antennas ranging from smaller non-directional to larger, more complex and very directional. We sell a directional yagi antenna that works well with the tracking receiver. See the shop. Any antenna can be used for tracking with a few simple tricks to determine the signal direction. A Yagi antenna that is tuned to the right frequency (433-434 MHz) will provide a huge advantage and greatly reduce the time spent looking for the plane. You can buy 433MHz antennas ready made. The tracker operates on the 433MHz ISM band; centred on 433.92MHz. This frequency is within (close-enough to) the HAM Radio 70cm band. This is a directional antenna that looks a lot like a UHF TV antenna. 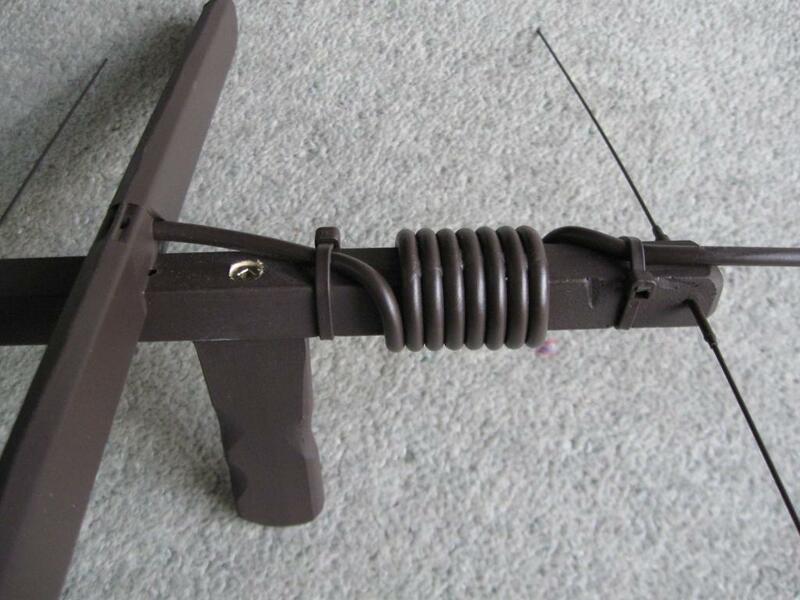 Actually, you can use a UHF TV antenna if you have to. 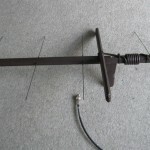 A Yagi antenna is useful for directional tracking. Pointing the antenna finds the strongest or best quality signal and indicates the direction to travel. A Yagi consists of a support boom and a series of elements; the reflector at the back, the driven or active element next and a series of directors out the front. The size, lengths and spacings of these are important. There are many web sites that offer calculators to work out combinations that should work. The two characteristics that we are interested in are the Gain and how Directional the antenna is. Gain is how sensitive it is and the more directional it is the easier it is to determine the direction of the signal. Gain and directivity are related or connected. What I have found is that a higher gain means more sensitive and directional at longer ranges but less useful at closer ranges. The yagi can be built to be better at long or short ranges. Because we are only receiving,we don’t need to worry quite so much about impedance matching complexities and SWR. The driven element is a loop or folded dipole. How it’s connected to the coax mostly determines the sensitivity of the antenna. For shorter ranges it can be simply connected to the coax centre conductor at one end and the shield at the other. For long range (higher sensitivity) a balun is required to match the coax impedance to the dipole impedance. A low cost UHF TV antenna balun works quite well but can be improved upon. 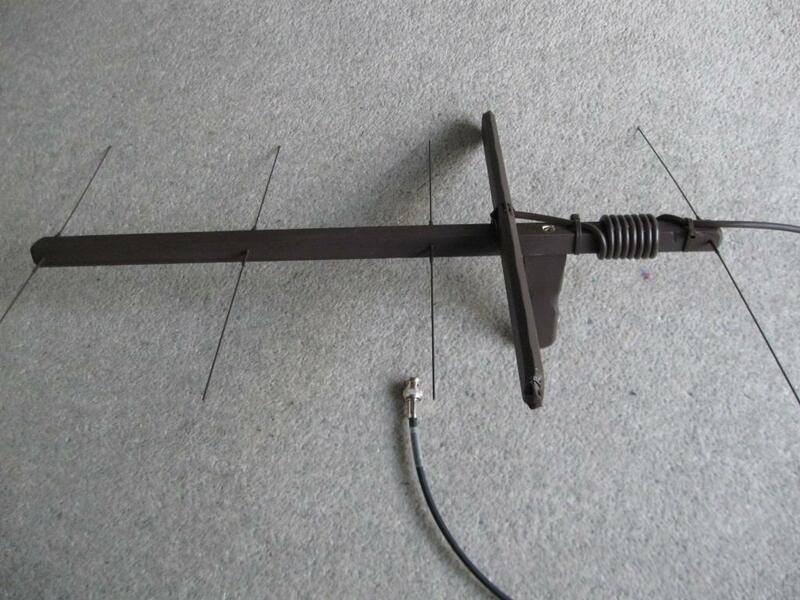 This is a simple directional yagi antenna ideally suited for use with our RC lost model tracking system. It’s designed to pack up to a reasonably small size and weight for shipping and storage. We supply it as a set of elements with lead and connector attached and some assembly hardware. We can generally supply other connector types although there may be a bit of a delay if they have to come in. Please ask. 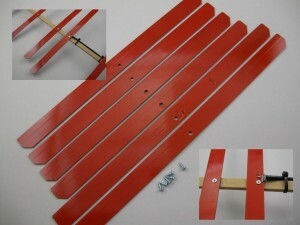 If you would like a fully assembled yagi, let us know. Shipping outside NZ is a problem due to size and shape when fully assembled. This is why we supply it as a DIY kit. 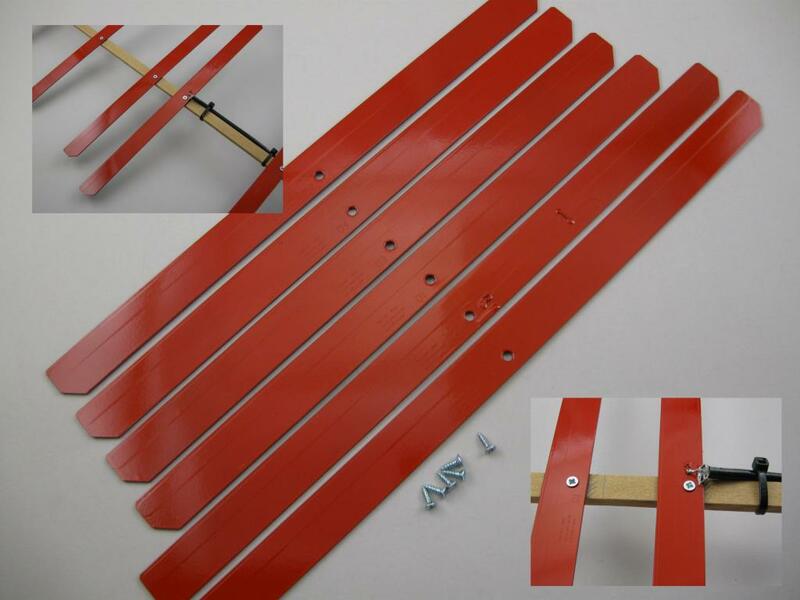 Wooden Boom: 700mm long is ideal and 10x10mm hardwood or similar. It’s not too critical; any straight wooden stick works well; up to maybe 20x20mm. Is mounting these elements flat on the boom OK or do they need to be tilted at right angles to the boom? Flat on the boom is best. What is the use of the 8 turns of coax on the boom of the original antenna design? Is the winding between the Reflector and the DE or between the DE and Director 1? Don’t worry about this. In theory it reduces the effect on the antenna when handling the coax and receiver. In practice it doesn’t make much difference. Is there a preferred distance from the antenna to the RX (always limited by the coax)? Can the antenna by mounted on the RX? Generally, the shorter the coax the better. Yes. Just keep the receiver behind the reflector. Baluns? What are they and where are they mounted? The balun is for impedance matching. To get the largest possible signal transferred from the antenna (DE) into the cable. In this design it is built into the DE. 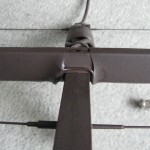 Will using metal screws on the boom (in order to attach a handle)affect the performance of the antenna? The screws don’t effect it enough to matter. The centre of the element is a neutral point; minimal effect. This is the hardest part of tracking; when you get close but cannot see it and the tracker signal is everywhere. We recently were looking for a tracker in thick scrub. It was helpful to move off 200 meters and direction find in from there. Within 50 meters the receiver had to be shielded and rotated to gradually reduce the distance. Within about 20 meters of the tracker I could hear the piezo-buzzer on the tracker beeping. Too sensitive can make tracking close in difficult. Say in a corn field or scrub when the model is 30 meters away and the signal is too strong to provide a direction. The problem is that you cannot easily have great long range performance and also very directional short range tracking. The receiver will pick up a signal even with no antenna connected. A shorted BNC plug may help. You need to shield the receiver from the signal; using your body and slowly rotating. Thinking about the Fox-Hunt transmitters we sell; these have much shorter antennas to reduce the signal transmitted. This suggests that if you are not likely to have to track too far away, and will not need full range, you could cut the transmitter antenna down. I wouldn’t normally recommend this as it can greatly reduce the maximum range; just in case one day you need it. Beyond the attenuator switches, the best sensitivity reduction is to reduce the antenna efficiency. In this case a crappy antenna can be better. You can reduce the gain of the yagi antenna by removing the directors, D4, D3, D2 etc. Minimum gain with some directivity would be with the reflector and driven element (DE) only. This does not really help when tracking close in. 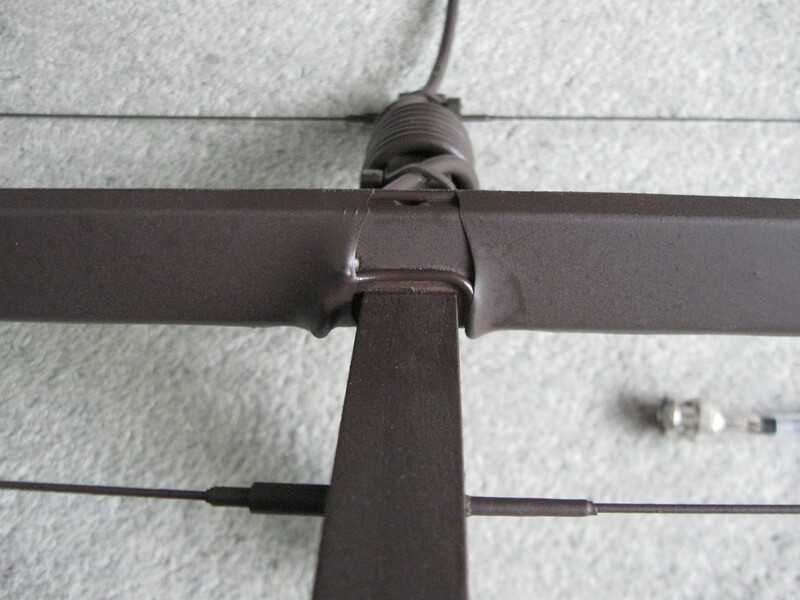 Rotating the antenna horizontal through vertical along the boom axis will greatly reduce the signal pickup. When you get closer, a simple wire antenna, or even closer, no antenna can be used by holding the receiver close to your body and slowly rotating so that you are shielding the receiver from signals coming from behind you. A simple antenna can also be a just a single wire connected to the centre pin of a BNC plug, or a loop of wire connected between the centre core and the screen. A 20-40cm loop should do. The smaller the loop, the less signal will be received. The smallest loop is a direct short circuit. 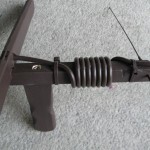 You can also use just the driven element (DE) as simple antenna. Hold it close and rotate slowly. This example is a relatively simple 5-element DIY design which with a good balun should have a beam width of about 55 degrees and a gain of about 7.5dbi. How it’s assembled doesn’t matter too much. This one is made of pine, 1.1mm music wire, hook-up wire, RG58 coax cable and a few odd bits of hardware. It has been painted with a spray can. The boom is pine 16x16mm, about 480mm long. The elements pass through the boom and are glued in place. The coax can have 7 or 8 close-wound turns around the boom between the reflector and driven element. This is supposed to reduce the effects of the coax on the antenna. The driven element is formed by attaching hook-up wire to a shaped piece of wood that attaches across the boom. Dimensions must be as accurate as possible,but to within 0.5mm would be OK. If using music wire or similar, be careful of the sharp ends. Some sort of non-conductive soft or rounded protection should be attached to the ends. Improvements for long range tracking would be to add more directors and a balun to get better signal coupling from the dipole to the receiver. A VHF/UHF TV antenna balun will work, if you can find one.